As trees grow, they draw carbon dioxide from the air to create sugar and cellulose for food and growth, locking some of that carbon into their wood as the trees age. What if the trees in an orchard could be considered a savings account for energy and carbon? When determining the value of an orchard, we may account for the fruits it bears, the air it cleans, and the labor it employs. But with California climate policies in place and carbon becoming a tradable commodity, we may also be able to calculate and account for the long-term value of a tree itself. 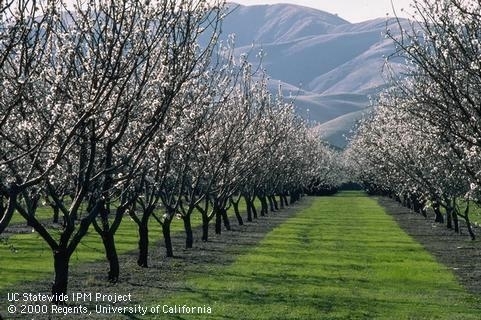 A new study underway at the UC Sustainable Agriculture and Research and Education Program (SAREP) aims to help growers and policymakers better understand the energy use, greenhouse gas emissions, and carbon sequestration potential of orchard systems throughout California. As trees grow, they draw carbon dioxide from the air to create sugar and cellulose for food and growth, locking some of that carbon into their wood as the trees age — in some trees for 25 years, in others like walnuts, for upwards of 150 years. Proper use of that carbon at the end of an orchard's life can have major implications for the overall greenhouse gas footprint of an orchard operation. Trees used for power generation after orchard removal have the potential to offset fossil-fuel related emissions created throughout the orchard's life. "Our preliminary study in almonds shows that the amount of fossil fuel emissions saved in this way is equal to almost three-quarters of the greenhouse gas emissions generated during the whole 25-year lifespan of the orchard, using current practices," says the project's director, Sonja Brodt, SAREP academic coordinator. "We think that this information could help to position orchard crops favorably for a consumer base that is increasingly climate-smart." This study, funded by the California Department of Food and Agriculture's Specialty Crops Block Grant Program, will focus on prunes, peaches, walnuts and almonds in all of the primary production regions of the state. Many farm management practices have an energy use component that the project will consider including water and fertilizer use, tractor use and post-harvest transportation. By understanding which parts of orchard operations use the most energy as well as how much energy is required to manufacture and distribute inputs before they even arrive at the farm, growers can increase the efficiency of their practices. Industry groups can also develop more scientifically-sound grower sustainability programs to improve energy efficiency more broadly for the state's many tree crop growers. "Energy is one input into agriculture that we have not thought about much from a whole supply chain point of view," says Gabriele Ludwig of the Almond Board of California, which funded a preliminary study on energy use and emissions in almond production and handling. "Yet the costs of energy, especially from fossil fuel sources, keep going up. The life cycle assessment approach used in this project can provide an analysis of where increased efficiencies may be possible." The project's collaborators include the UC Cooperative Extension's Sutter-Yuba office, the UC Davis Department of Civil and Environmental Engineering, Department of Land, Air, and Water Resources, the Department of Plant Sciences, and graduate students in Horticulture and Agronomy and International Agricultural Development. By working with growers throughout the state, project staff will be able to ensure that orchard management practices included in the project's models are representative of current practices. 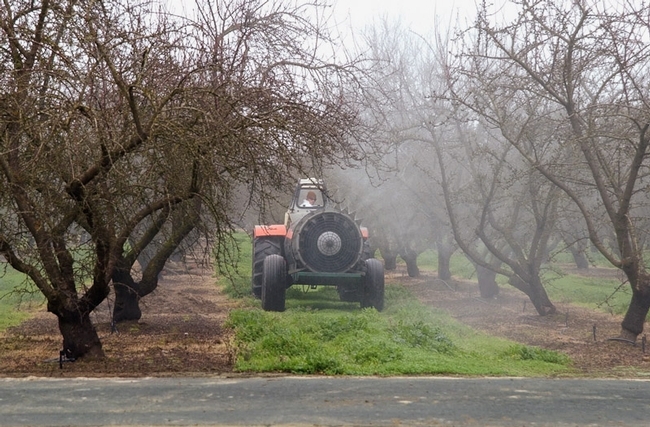 Growers interested in providing confidential input about their orchard practices are invited to contact Brodt at sbbrodt@ucdavis.edu or (530) 754-8547.